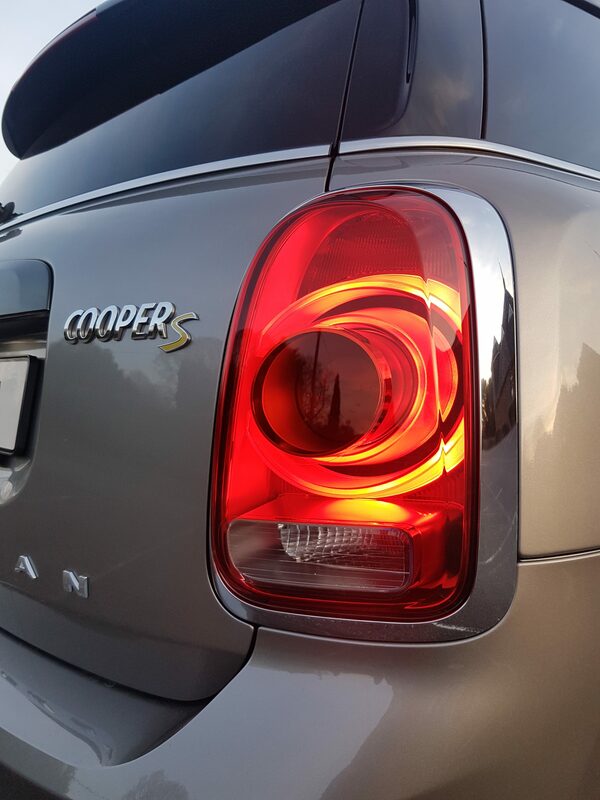 Launched last year, the Countryman Cooper S E All 4 is the second step from Mini into electrification, after the very exclusive 2009 Mini E tested by a limited number of drivers. 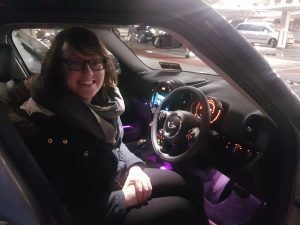 So what is it like to drive ? 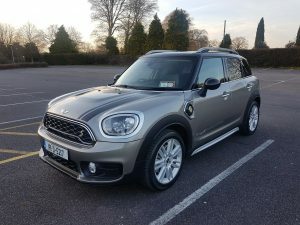 This Mini Countryman is the SUV model from the British/German brand. In 2017 was launched the second generation, which also offers in petrol and diesel engines ; This Cooper S E All 4 variant is sitting at the top of the range, in terms of cost but also power (if we except the quite exclusive JCW) and features, with its standard 4 wheel drive and automatic transmission (both optional on its Cooper S and SD sisters). 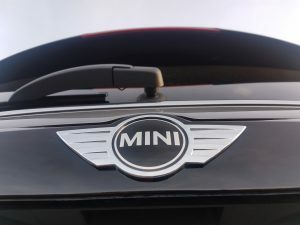 The powertrain consists of a 136hp turbocharged 1.5 liter 3 cylinder engine (from the Cooper) mated to a 6-speed automatic transmission for the front, and a 88hp motor driving the rear wheels, and supplied in electricity by a 7.6kwh battery pack. All this adds up to a maximum of 224hp. Not too bad for a small family SUV ! This setup is not unique as you will find the exact same powertrain in the BMW 225xe Active Tourer (the Countryman shares its platform with, as well as the BMW X1 and new X2). 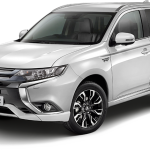 As it is the case for most PHEVs (Plug-in Hybrid Electric Vehicles), the limited battery size will not allow a huge range on electricity only. 41km NEDC means 25km real life in winter, using the heater, and maybe you can et 30 or 35km in summer, driving economically. But this is just the tip of the iceberg, as you are going to explore the different driving modes. And these driving modes are quite awesome. You can select them by flicking the eDrive toggle switch on the centre console. 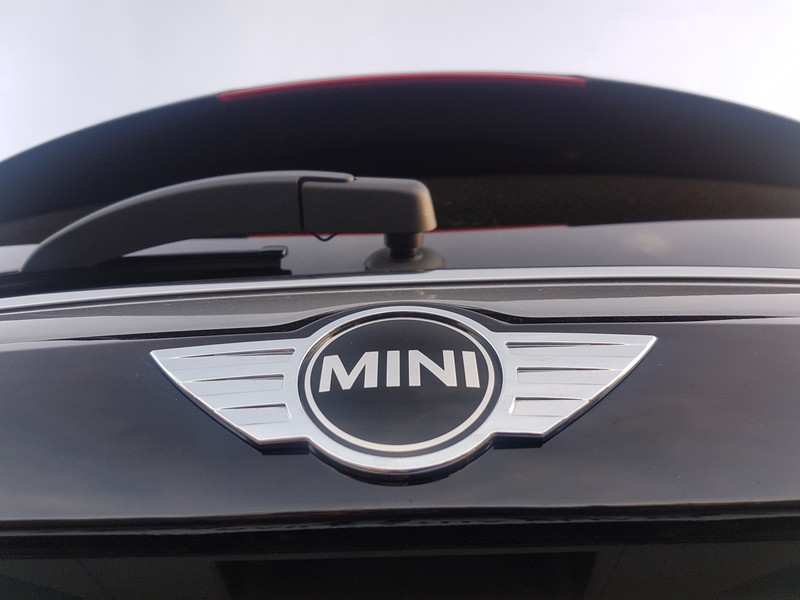 The Max eDrive is simply a 100% EV mode, it will only use the petrol engine if you need all the power (you will have to fully press the accelerator pedal for that). Below 6% battery level, the driving mode will switch automatically to Auto eDrive. This second mode is your classic hybrid setup, where the car will choose to run on electricity or petrol (or both), depending on the situation. Basically at low speeds/low acceleration, it will use electricity, at higher speed petrol. 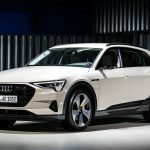 Finally the Save Battery is an interesting option : it will make the petrol engine work a little bit harder in order to recharge the battery. 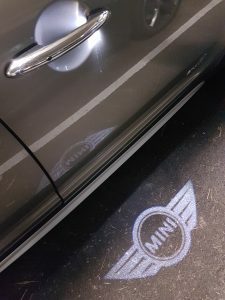 This can be useful if you are driving on a long distance and want to keep a certain battery level for the urban sections you will drive across. Using these 3 modes, you can outsmart the car in terms of efficiency (As good as the car is, only you know exactly what the next hundred kilometres will be made of!). But there is more ! Another toggle switch can allow you to choose between Green, Mid and Sport modes. 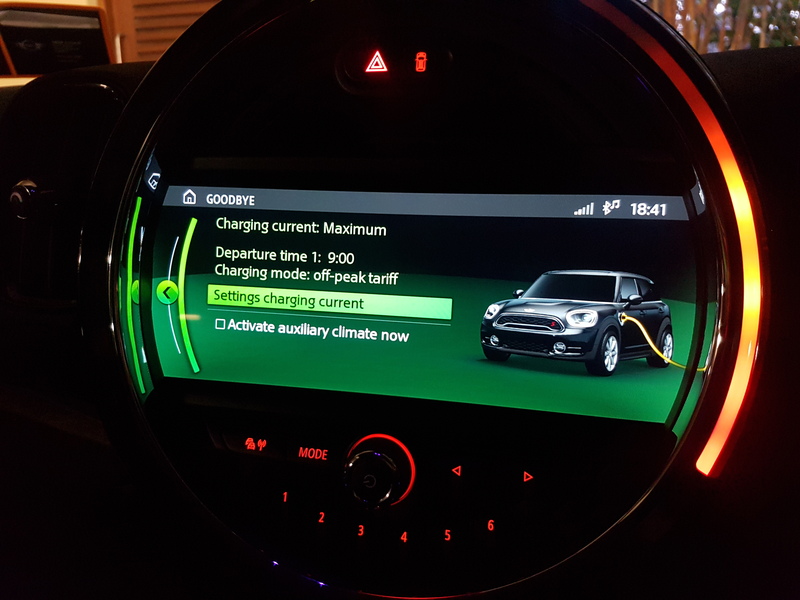 Green is an interesting mode as it has no regeneration at all when slowing down, it will just coast, a feature that many EV drivers would like to have on their own car. 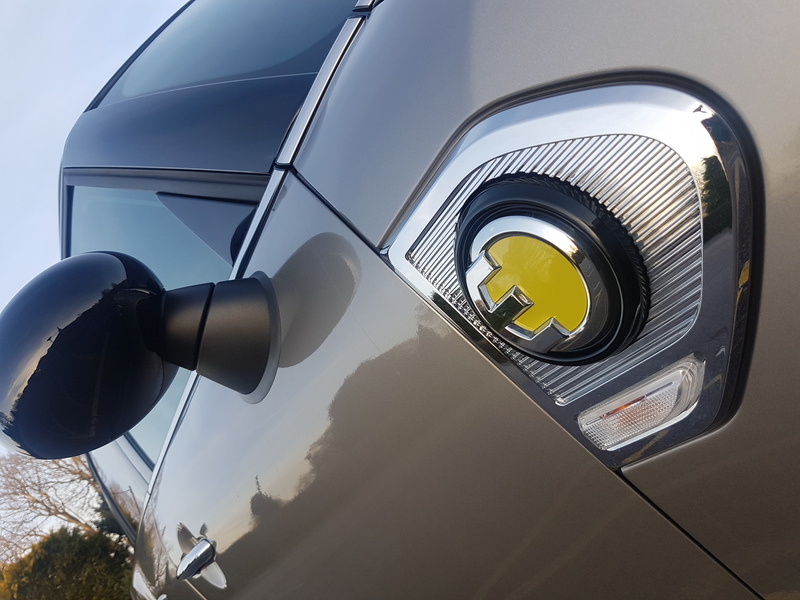 On the opposite the Sport mode will switch faster to petrol, with gears changing at higher revs, and when lifting off the accelerator down it will not select the highest possible gear for best efficiency. The car will cut petrol supply of course but stay in gear to give a more aggressive regenerative braking. Using this mode will effectively allow you to recharge the battery, even in Auto eDrive mode. And these combine with each of the 3 eDrive modes, for a total of 9 actual configurations. Impressively, a combination of Save Battery and Sport modes can make the car regenerate at over 60kw ! (yes, you have a display showing that). 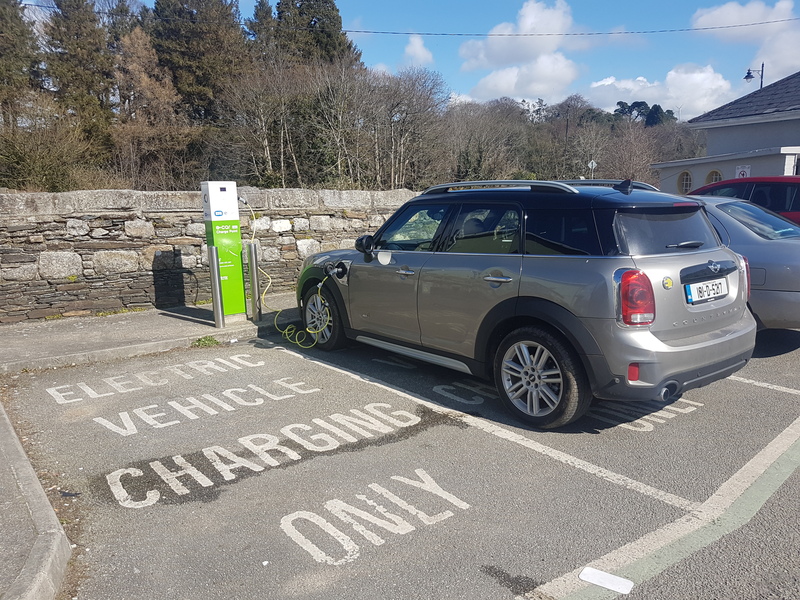 2 hours 15mn is all you need to fully charge the Countryman’s battery at a public charger. 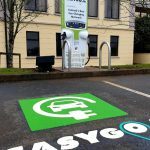 If you want to recharge by plugging the car, you won’t get more than 3.6kw of charge. This is completely acceptable considering the size of the battery : The car comes with a type 2 cable, and a 3-pin granny cable. 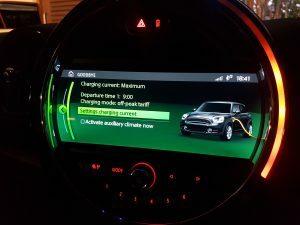 Note that you can reduce the power taken from the charger, as low as 6 amps, all that from the entertainment screen of the car. 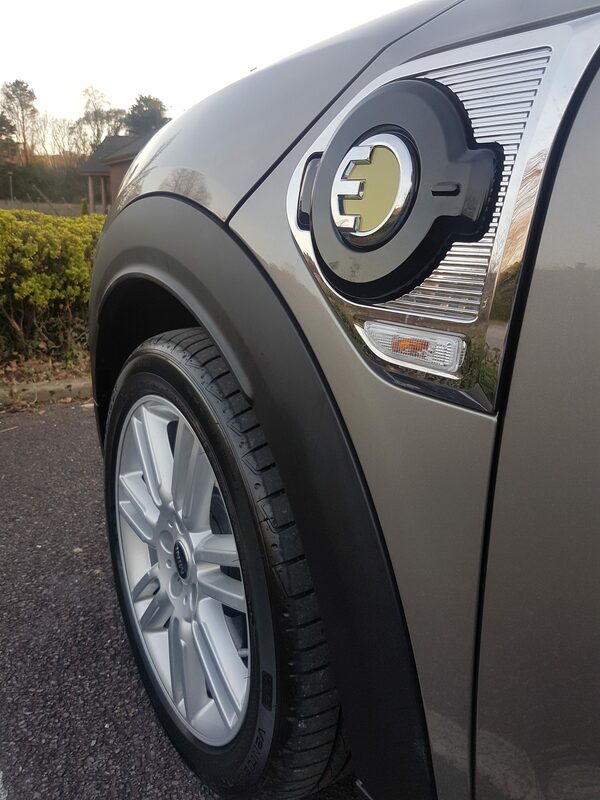 With the type 2 (16 amps) cable, the car can charge from empty to full in 2 hours and 15 minutes. Allow an extra hour on the granny cable (10 amps). Charging port is on the passenger side of the car, which is good for us driving on the left side of the road when you are parallel parking. No one wants to have a cable connector sticking out on the street side. 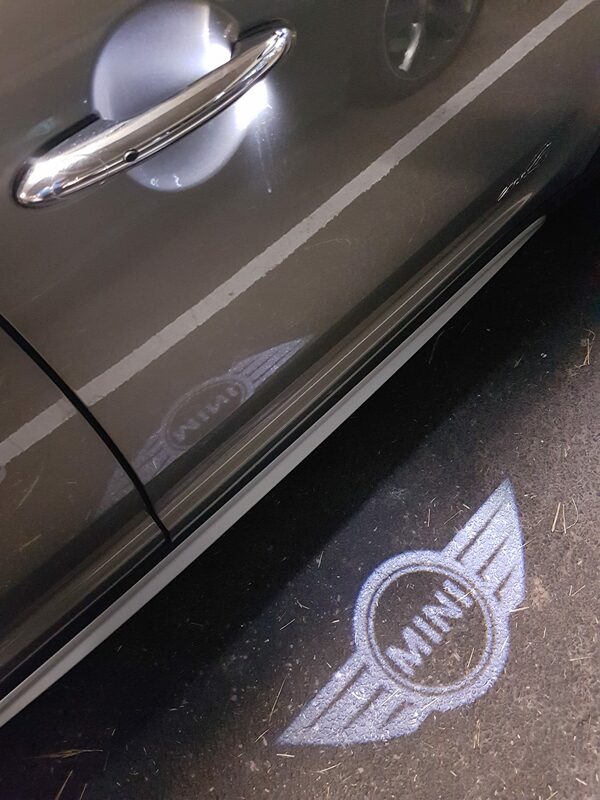 As with many EVs you can set night saver times too. To know what this car was like, I decided to drive it in various driving environments. Commuting in and around Cork was my city test. The 25km range was perfect for my 20km return trip to work. Many of us drive such distances on a daily basis, and this allows to run without a drop of petrol till the weekend) Mission accomplished. Around town the compact size of the Countryman (4.30m, half-way between a Nissan Leaf and a Renault Zoé) is ideal, and the visibility is good too. 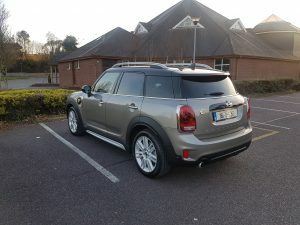 Only downside is the comfort, quite firm (it’s a Mini!) so you really want to avoid the potholes. I would stick on the standard 17 inch wheels instead of the optional 18 inch wheels of this test car. It’s Saturday and I’m off to the motorway. The comfort is now ideal on the smooth M8 to Dublin and the trip can be completed is just over 2 hours, just like in any ICE car. On the fuel economy side, cruising at 120 kph will make it consume 8.5 liters per 100km of unleaded (7 liters at 100 kph). Not super impressive but not abnormal considering there are barely any benefits for a hybrid to drive on the motorway, and at the end, we have a 1.5 petrol 1.7 ton small SUV to move. I could use the Save mode to enjoy a bit of electric only miles when I left the motorway, and drove into Dublin, perfect. Meanwhile 2 thirds of the tiny (36 liters!) 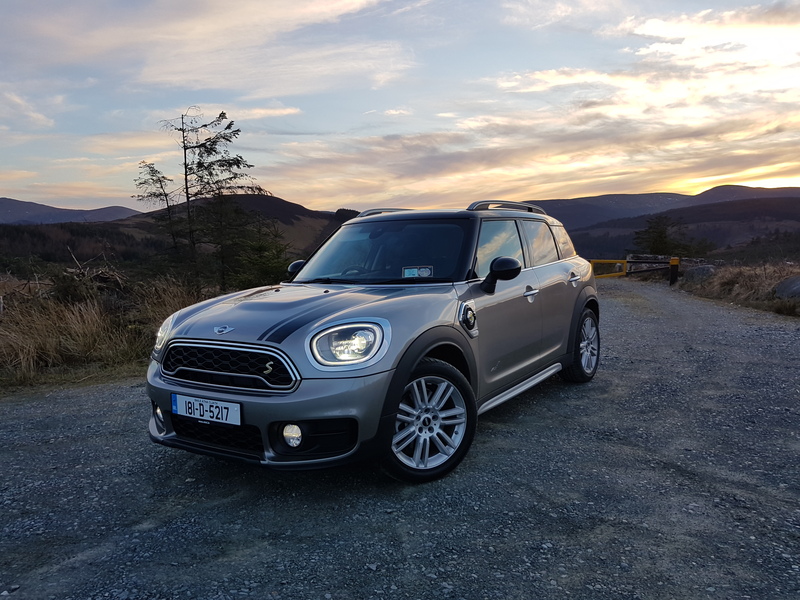 petrol tank were already gone… Saturday afternoon, sun, and it was time for me to test this Mini on the twisty Wicklows roads. That’s what Minis are supposed to be good at, right ? 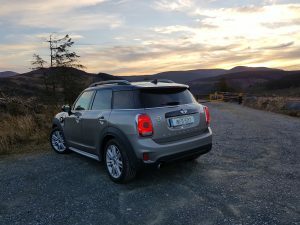 I leave the M50 at junction 12 and off to Sally Gap. The car makes much more sense there than on the Motorway. 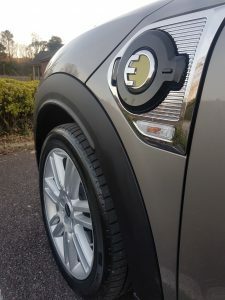 It is pleasant to drive and efficient too, at low speeds the electric motor being quite happy, while the batteries recharge when going downhill. At higher speeds, on Auto eDrive (cause eventually the petrol engine has to work), the Sport mode appears very rewarding, exhaust sounds great (I can’t believe I’m writing this) and the chassis is impressive. Of course it has 4 wheel drive so using all 225 horses won’t challenge the traction control, but the amount of grip is truly impressive. Even on dusty ground at low speed you can floor it, and the wheels won’t spin (no torque steer either). 0-100kph in 6.8 seconds. 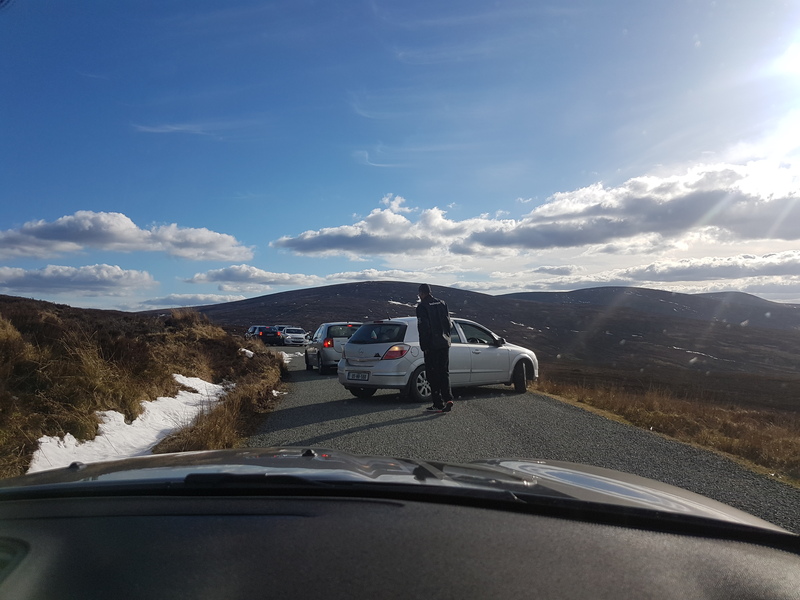 Arriving near Sally gap, I realize that the road is closed and it’s time for a 17-point turn (nothing appears on the screen, looks like the rear view camera is an option!). I now start to think that leaving Dublin with a third of tank was not such a good idea and I’m going for a big detour to reach Glendalough while range anxiety is invading me. 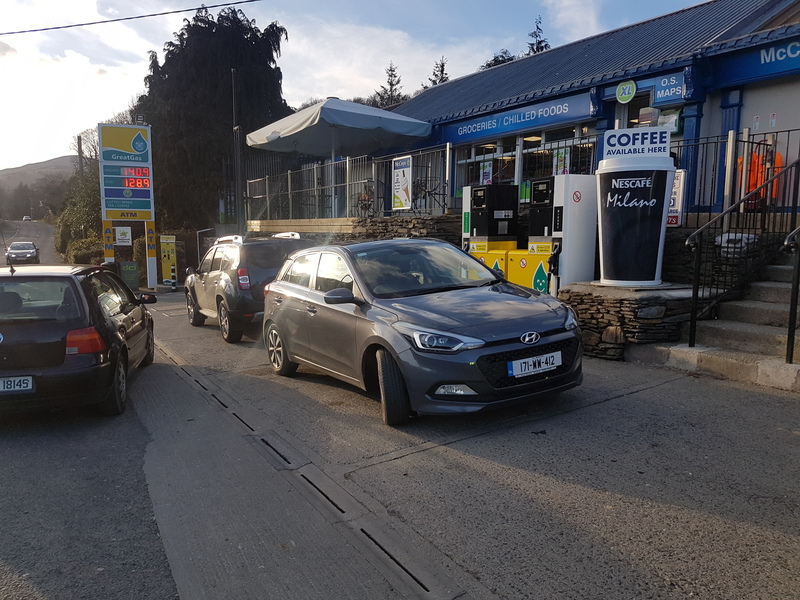 You would thing there are plenty petrol stations around, but nope, nothing between the M50 and Glendalough. I knew I was not completely hopeless as one of the hundreds 3-pin sockets I drove past could have saved me while ICE drivers had to fear the worst. The range estimate from the trip computer is pretty pessimistic which is good, as it won’t give you a sweat like a Leaf does. 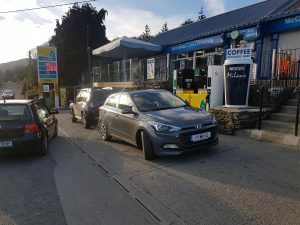 I was happy reaching the unique petrol station the area, in Laragh, till I realize ICE cars had decided to have a gathering around the unique petrol pump. Yes, the one day I need to put petrol in a car, I get ICEd, Doh! After a few minutes waiting and the equivalent of a good meal spent on this expensive liquid, I was back on the road, with enough range to get me back to Cork (450km). Driving on the secondary and N roads was really a joy, and fuel economy went below 7 litres per 100 km, without trying to drive economically. And as a family car ? 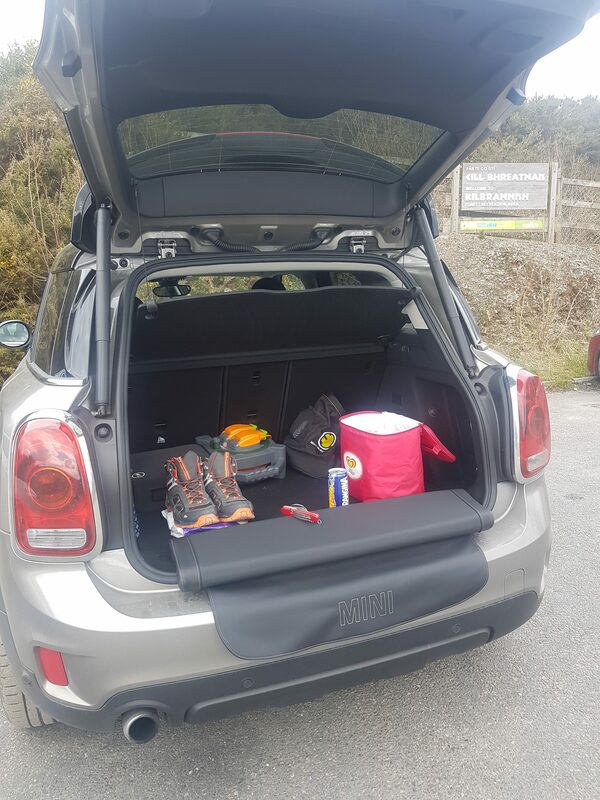 The wonderful picnic bench, really useful if you are the outdoorsy type ! It is quite brilliant at it. 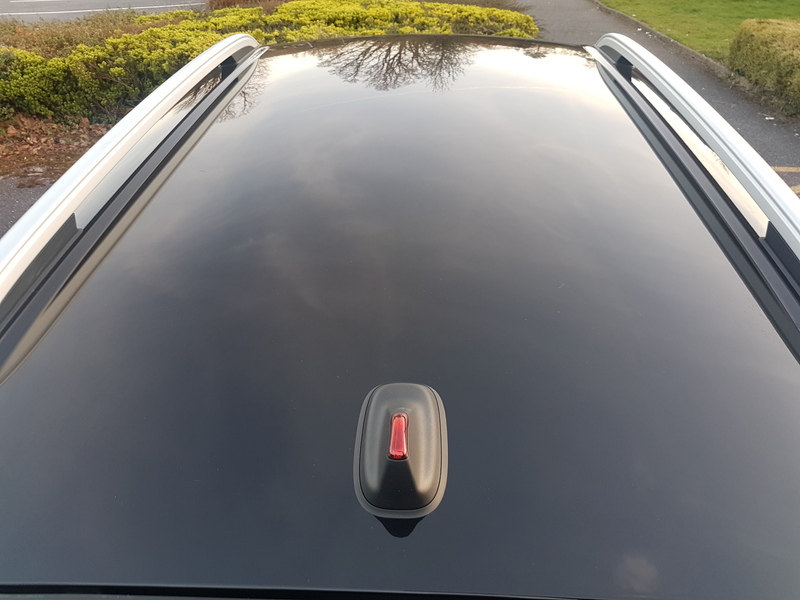 The boot is 405 litres, which is not huge but sufficient for a family car of this size, with a wide opening. Most importantly it is boxy and the seats fold flat, aligned with the boot floor. Not something you find in many EV/PHEVs. Interior space is good, 5 persons can travel comfortably. The picnic bench, that you can is one of these brilliant ideas if, like me, you are the type of person sitting on the rear of the car to change shoes after a hike or simply having a picnic. It stores itself just below the boot floor. In the interior you will also find 2 USB sockets and a very handy wireless phone charger located inside the armrest. The infotainment system has Apple Carplay but unfortunately no Android Auto. Still my Android phone paired perfectly and could use the steering wheel commands to go through my Spotify tracks. 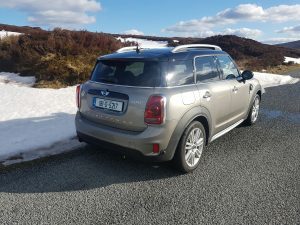 So this Countryman starts at € 44,730 . 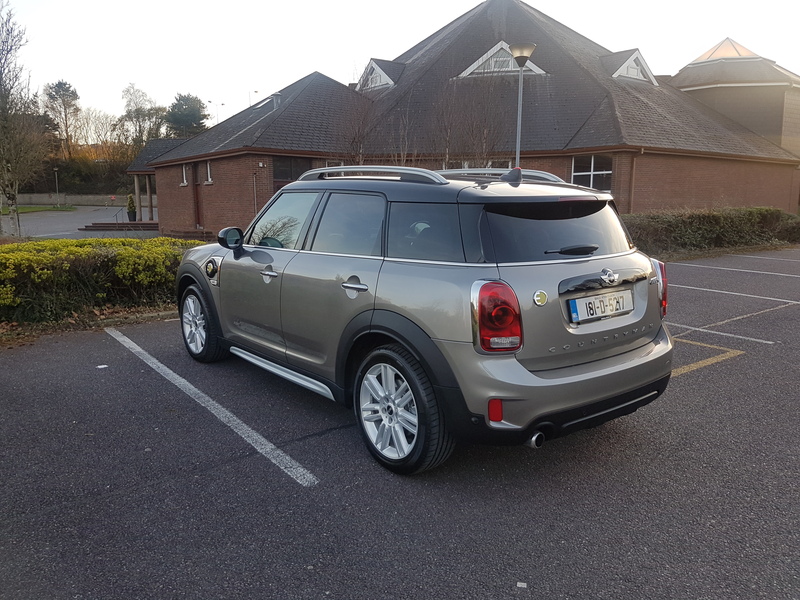 Don’t forget to subtract the € 2,500 VRT rebate and the € 5,000 SEAI grant, and this means you can drive one of these from around €38,000. It can sound like a lot but don’t forget that a VW Golf GTE starts at around the same price and an Audi A3 will be over € 40,000, both being less practical, less powerful, less stylish. This car is really ticking a lot of boxes. The Countryman S E All 4 is also an obvious choice for anyone looking for a powerful Countryman. 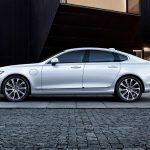 S and SD All4 automatic variants are even more expensive while not matching the performance of the S E All 4. 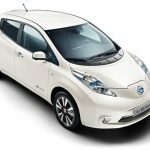 So why bother with conventional petrol or diesel ? Do not forget that as for any other premium German car, you will be tempted to add many -expensive- options in order to make it the way you like. If you are already an EV driver, the short range will hardly convince you. However if you are not electrified yet, and looking for driving a sporty family car, without relying on the public charging network, you will not be disappointed by this Countryman plug-in hybrid. 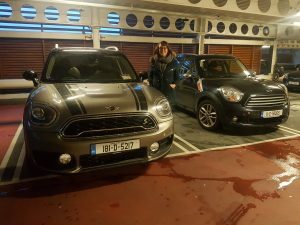 Aisling is the happy owner of a 2011 Countryman and was happy to give me her feedback on the new model. Thanks to BMW Ireland for lending me this car.